Désolé pour les unilingues Français mais l'article est en anglais... mais tout de même très intéressant! Serjad Makmadeen was born in Princes Town in 1910 and was the last of the eight children of Makmadeen, an immigrant from the Punjab, and his wife Rosalin Jamaria who hailed from Martinique. When he was still quite young the family moved to Bellevue in St James, and he attended primary school up to the age of ten. After this, economic circumstances forced him to leave school and he secured employment as "the gardener" at the large property known as Ellerslie in Maraval. Life for young Serjad Makmadeen was extremely difficult. Poverty stalked his existence. Each morning he rose early and after his meagre breakfast of a cup of "cocoa tea" he walked across Long Circular Road to start the day's work with only a short break for lunch which he had prepared and brought with him. Serjad worked as a gardener until he was 13, when he got a job as a baker's apprentice at the MI Bakery on Charlotte Street, in Port of Spain. Soon he became involved in selling bread and cakes and would deliver his goods to customers on a bicycle. To develop a large clientele, Serjad gave an extra loaf to anyone who had purchased more than 12 loaves, paying for this extra loaf out of his own pocket. This allowed him to build up a substantial clientele in a short space of time and he soon became the bakery's top salesman. Having come from a situation of poverty, Serjad was determined to make a better way of life for himself. He saved his small salary and began to look for opportunities of self-improvement. In the thirties, whilst still working at the bakery, he learnt that one Mrs Bajnath had a small soft drink plant for sale in St James. Having accumulated $350, Serjad borrowed $250 from his friend Nagib Elias, and bought Mrs Bajnath's soft drink plant. It was at this time that he got married to Khairoon Khan who worked with her husband in running the plant. Everything was done manually: She washed the bottles, boiled the syrup and hand filled the bottles, also adding the carbonated water and capping the bottles. The plant produced one bottle of soft drink per minute. Using old beer bottles, two flavours of soft drink were produced: Cola Champagne and Banana. Serjad would make one or two cases of soft drinks per day after he finished work at the bakery, which he would take with him on his rounds the next day. As he knew most of his customers well, he was able to convince them to buy his soft drinks. The difficulty of an East Indian breaking into the soft drink business in a colonial society was evident from Serjad's following experience. When he first acquired the plant he wrote several times to various soft drink producers in England enquiring on how he could make improvements. It was evident by his name that he was not an Englishman but an East Indian so Serjad recognising this, changed his name to JOSEPH CHARLES, which quickly led to communication between himself and the hitherto silent producers. Joseph Charles soon started to have a problem with the availability of bottles. His clientele was growing and he could not get enough bottles to satisfy the demand. Moreover he did not have sufficient capital to buy new bottles. He read in a magazine that a soft drink factory in Montreal was closing down and its assets were up for sale. He realised that this would be the source of empty soft drink bottles, which he promptly bought and shipped to Trinidad. 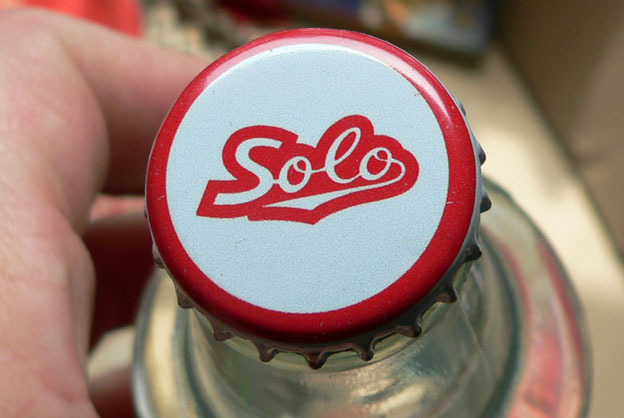 The bottles, however, had a brand name "SOLO" and a logo - a pilot drinking from a bottle of soft drink presumably after a solo flight - stamped on them. Joseph made the expedient decision to keep the brand that has been maintained to this day, along with the distinctive heavy glass Solo bottles. This acquisition of the brand, which later gave birth to the popular catch phrase "A roti and a red Solo", was one of those happy accidents which is a combination of outside influences, business decision-making and sheer good luck. After the Second World War and with demand for his soft drinks, Joseph bought an additional plant from the Dugar Brothers in British Guiana and went into the soft drink business as a full time occupation. He relocated his factory to the area under his house on Panka Lane, St James. This plant was an improvement on the old one and had the capacity to produce eight bottles per minute. By 1950, a new plant was set up at the corner of White Street and Tragarete Road opposite the Queen's Park Oval with new equipment imported from the United States. This plant produced 72 bottles of soft drink per minute. During the decade of the 50s, Joseph Charles sought to consolidate his business. He was forever striving for consistency in flavours and paying particular attention to cleanliness and quality. At his new plant he now employed 20 workers including his two sons, Vernon and the younger Kenneth, who would go to the factory after school and at vacation time to assist and learn from their father. Joseph worked long hours to develop his business, beginning at 4 o'clock in the morning and sometimes leaving the factory at 11 o'clock in the evening. He now hired salesmen to sell his products and made sure that they left the factory at 4 a.m. so as to be the first to get to the customers. Despite his limited formal education, he ensured that he knew how the plant operated and single handedly modified his factory so that it produced 144 bottles per minute. At this time he introduced four new flavours: Cola, Grape, Cream Soda and Orange; added a shift system and increased his staff to 65 people. By 1958, the White Street plant became too small for Solo to service its customers efficiently and Joseph Charles was able to secure a loan from the Canadian Imperial Bank of Commerce for $1.8 million and in January 1960 constructed a new state of the art factory in San Juan on the Churchill Roosevelt Highway. The new plant and machinery were purchased from the United States and were fully automated. In 1962 he introduced the still widely popular SOLO APPLE J.
Joseph Charles died in 1965 and is succeeded by his youngest son Kenneth and his family who now own and operate the company. Like his father before him, Ken has continued to buy new technology to increase efficiency and productivity of the factory and it is now a fully computerized plant. Joseph Charles Bottling Works is a popular and well liked company. It is involved in many community activities and sponsors the steelband Solo Pan Knights as well as table tennis and badminton competitions. 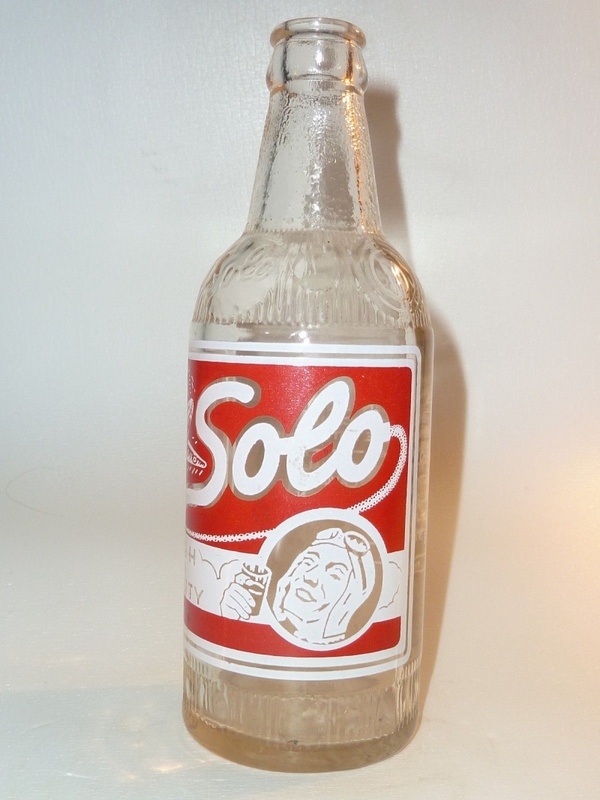 It supports power boat racing, and "Mr Solo" is a regular and popular champion. The highest accolade for any brand is affectionate reference to it in popular culture. 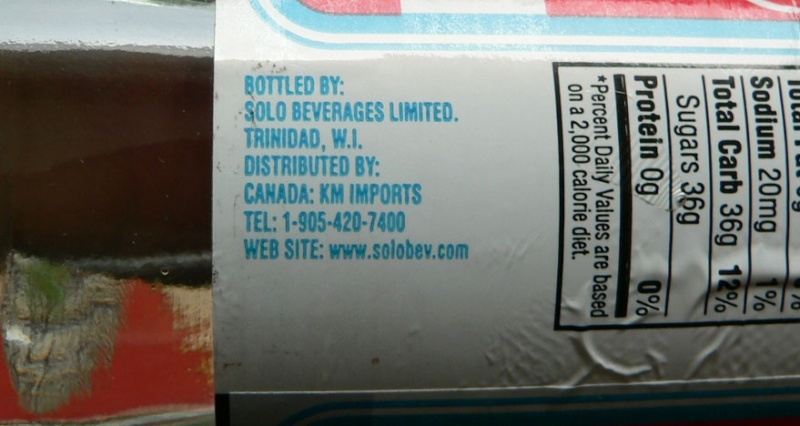 The Joseph Charles company has achieved this with two of its brands, "DOUBLES AND APPLE J" sung in calypso, and its slogan "A ROTI AND A RED SOLO" included in a rap. When Miss Universe, Trinidadian Wendy Fitzwilliam said publicly that she missed her "ROTI AND RED SOLO", she confirmed that the company first founded by Joseph Charles had truly entered the Caribbean heart. Joseph Charles was a good family man and imparted sound values to his children. He was self-taught, read a lot and mastered the mechanical workings of his plant. He was a man of integrity and charity - always helping the poor in many ways, and sponsoring dinners for them at regular intervals. He looked after his employees, often providing houses for many. He shunned publicity and was a most humble person. The Trinidad and Tobago Chamber of Industry and Commerce is indeed honored to induct Mr Joseph Charles into the Business Hall of Fame. En voici une photo; cette bouteille s'est vendue récemment sur eBay. Et voici la bouteille telle qu'on la retrouve aujourd'hui; celle-ci contient du Cream Soda qui, soit dit en passant, est vraiment bon! Et ça se vend où au juste ? J'ai finalement développé un goût pour le cream soda, après des années d'aversion. Ouin, ça se vend ou???? Je l'ai eu en cadeau de Johnny; c'est à lui de nous le dire! » de la boisson gazeuse flat....êtes vous capable de boire ca ?